Urb. Torregalera s/n, 18690 Almunécar, Spanje. Playa Calida Spa is a recently built hotel which belongs to the line "New Generation Hotels". Wide, light reception area with fountains. From there it is possible to get to a nice courtyard sorrounded by garden and a pool with the shape of a river. 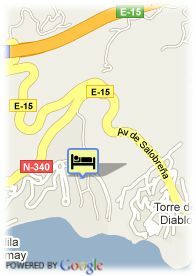 Onwards, there is a walk of palms that ends on a pool of 1000 m2 with a breathtaking view over the sea and Almuñecar. Wide, sunny, rooms with big beds and a well cared distribution. For those who want to relax themselves, the hotel offers Spa and Wellness Acquaplaya sevice. Customers will be able to enjoy the water area or have a personalizaded treatment based on their need. the heated pool is closed during the seummer. Furthermore, if customers need to organize a meeting or a celebration, the hotel puts at their disposals different rooms with different capacities, all with the best service they can imagine.